The eLink API is primary interface for programmers and report writers to extend and customise Fieldpine Point of Sale. This page documents advanced technical features for developers that wish to interface to Fieldpine Retail via the HTTP interface. eLink defines a set of calls to HTTP endpoints. These calls can read and write most of the information stored inside the retail system. These eLink APIs are able to handle the variation on environments, database and configurations. 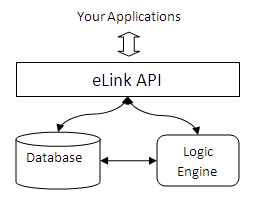 eLink is a large API with a wide spread of functionality. While the basic idea of a retail system is simple enough (products are sold to customers), they rapidly expand in scope into diverse areas such as stock management, ordering, receiving, CRM, security and auditing, system monitoring, statements, prepay vouchers, loyalty programs and more. sLink APIs. Supplier Link API to handle interfaces to and from supplier systems. cLink APIs. Customer Link API to handle interfaces to and from customer portals. Most documentation of the individual API calls will display examples in XML. This is only because XML is more widely understood and makes the examples clearer. retailmax.elink.customers Retrieve details about known customers in the point of sale database. retailmax.elink.cardinquiry Lookup details of a single card held by a customer. This can be a prepay card or discount voucher. retailmax.elink.product.paretolist Ranking of products using pareto techniques. Used to get "best product"
retailmax.elink.sale.create Store a complete new sale into the retail system. retailmax.elink.staff.used.list Returns information about when various staff logins were used. retailmax.elink.journal.list Recall list of transactions requested. The journal is written before requests are processed and will include requests that were rejected. retailmax.elink.barcodes Information about barcodes and what they reference, such as products, customer loyalty cards etc. retailmax.elink.supplier.partcodes Individual supplier part codes for products. retailmax.elink.locations Detailed information about store managed by this retailer. retailmax.elink.location.lane.list List of lanes or checkouts used in each location. Information about barcodes and what they reference, such as products, customer loyalty cards etc. retailmax.elink.stock.asn.add Upload an advanced shipping notification (ASN) for pending arrival of stock. retailmax.elink.ticketing.doorscan Record a ticket usage at point of entry, marking the ticket as redeemed in the process. Product items define the individual items that can be sold or purchased in store. You need to create a product record before you can sell or purchase items. Supplier records define the people and companies you purchase products from for sale to your customers.